Norman Lear & Peter Montgomery @ The Hollywood Reporter: Why Do People Fall For Fake News? Zack Stanton @ Politico Magazine: How Betsy DeVos Used God and Amway to Take Over Michigan Politics. Casey Quinlan @ Think Progress: Betsy DeVos says guns in schools may be necessary to protect students from grizzly bears. Hemant Mehta @ Friendly Atheist: Catholic League: Acknowledging the Marriage of Two Gay Men is “Fake News”. Steve Benen @ The Maddow Blog: Trump demands credit for jobs he had nothing to do with. 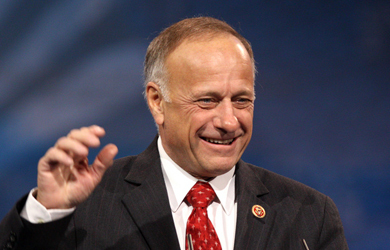 Chris Massie @ CNN: Rep. Steve King: John Lewis trades on status as civil rights icon, hasn’t contributed since.